The Delaware County Air Force Junior Reserve Office Training Corps pose with the trophies it won at the 15th annual Chief Richard Halsell Memorial Drill Meet held at Hayes High School on Saturday. Over the weekend, the Delaware County Air Force Junior Reserve Office Training Corps (AFJROTC) hosted a competition at Hayes High School and took home third place overall. Lt. Col. Russ Anible said eight teams from across Ohio came to compete in 12 different categories at the 15th annual Chief Richard Halsell Memorial Drill Meet. Anible and Senior Master Sgt. Douglas Manley, the coach for the Delaware County team, said they had been planning the event for three months, and it was staffed entirely by volunteers. 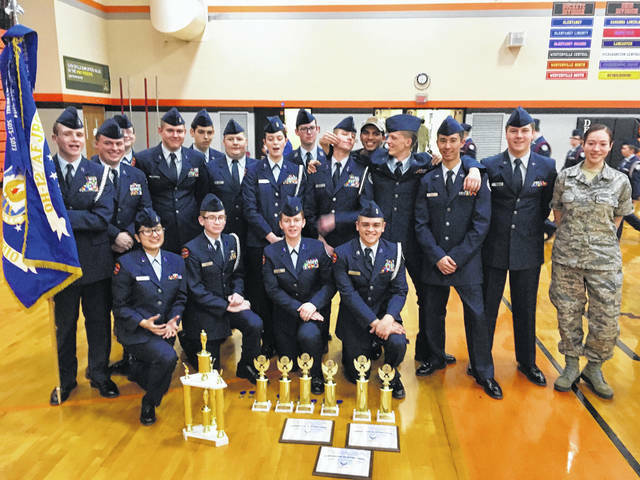 Manley said the Delaware County AFJROTC team has five competitions left in the season, and he was proud of the team’s performance at the competition. Anible said students compete in events for anywhere between four minutes to 15 minutes at a time and are judged on their executions of commands, from memory. Manley said the number of commands range from 35 commands to 75 commands. Anible added that there are four judges that walk on the floor with the team, grading and scoring them on the most minute details. Anible said the event has special significance for him and for many members of the community because the competition is named after Master Chief Richard Halsell, who coached the AFJROTC team from 2000 to 2008 before he passed away. “I had the privilege of working with him for four years, and then we lost him to cancer,” Anible said. He added the competition is a way to carry on Halsell’s legacy. Manley said he is retiring this spring and said he’s focused on preparing the team to continue to perform well after he’s gone. Anible said the five years that Manley has coached the team have been the most successful five years in the team’s 52 year history. Anible and Manley thanked the community for their support and thanked all the volunteers who helped make the event possible. https://www.delgazette.com/wp-content/uploads/sites/40/2018/02/web1_ROTC.jpgThe Delaware County Air Force Junior Reserve Office Training Corps pose with the trophies it won at the 15th annual Chief Richard Halsell Memorial Drill Meet held at Hayes High School on Saturday.